Play it now, it’s free! Download it or play it online HERE. Our goal was to make a game that could demonstrate the importance of sound. However, we didn’t have much budget, so we decided to make a story that would revolve around a déjà vu – this way we would only need one scenery (ideal for our finances). This would also allow us to demonstrate how sound can influence the perception of an image; as you’ll experience in the game, changing the sound of a single scene can completely change the whole game experience. Sound can influence your emotions at subconscious levels. Sound can manipulate your thoughts and make you believe that something is sad, or happy, or scary. The potencial of sound is huge but barely exploited among many developers. The music in Déjà Vu is Dynamic. This is necessary to avoid tracks from sounding repetitive. Each theme changes depending on the actions of the player. They are structured with blocks so that each song can respond better to gameplay. In addition, the music in level 3 is made up of layers that are useful to add variety to the game. 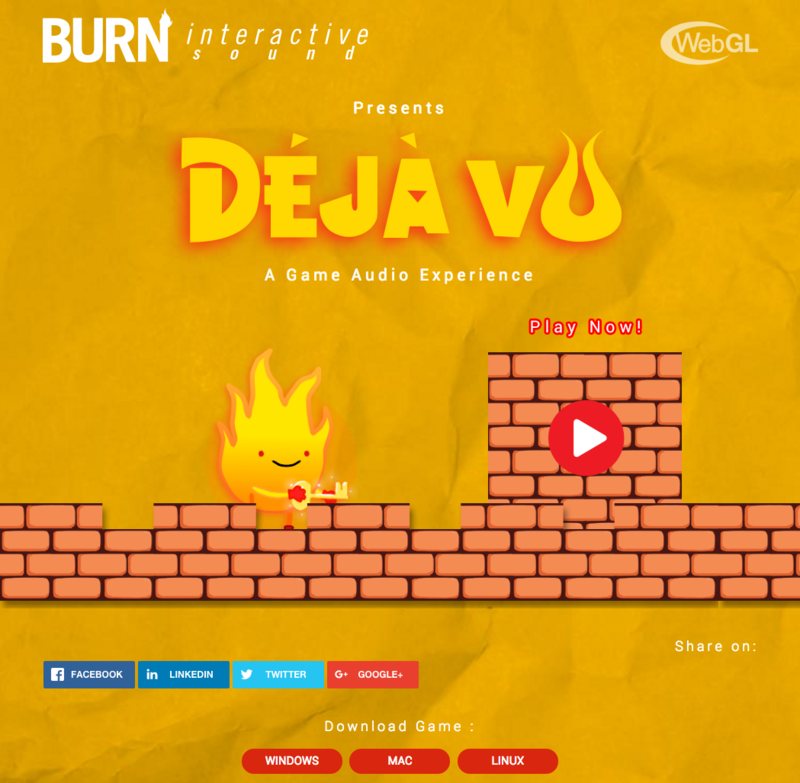 Déjà Vu was developed in Unity. We wanted to implement dynamic music, but we also wanted the game to be available to play online. Unfortunately, Unity isn’t very flexible for audio, and we began to have gaps and pops between music blocks. We thought about using middleware such as Wwise, but it was not compatible with Web. Finally, we decided to use Fabric, a plug in that is basically an extension of the audio system in Unity. By the way, we’d like to give a special thanks to Italo Capasso, programmer of the game, for having done such an awesome work and being so patient with us. The standalone of the game is available for Windows, Mac, and Linux. You can also play it online through our landing page if you have Firefox or Safari. Image of our landing page. Click on it to visit it and play the game online! Tariq is a Sound Designer, Rec & Mix Engineer, Haiku Writer, Barman, Live Sound Mixer, Time Traveling Video gamer, Randomness Encourager and Musician from Bogota. Check his personal soundcloud here. Filo is a Music composer/producer/game audio maniac who’s always ready and willing to try new ways of music interactivity and composition. Check his Synth-Pop side project DENIM! Naila is the manager of these two chaps. She’s the one in charge of all the PR, marketing, and all that stuff. She’s also the sound designer of the team. 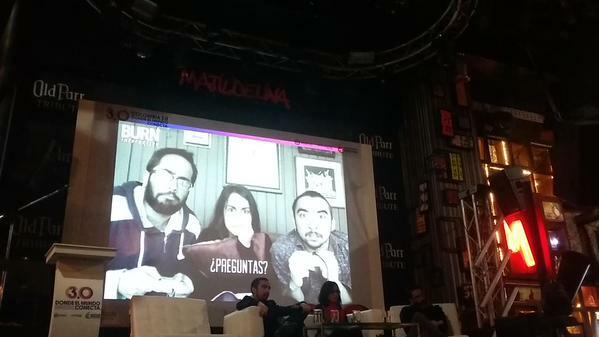 Naila runs a game audio blog for the Spanish speaking community available at this link. 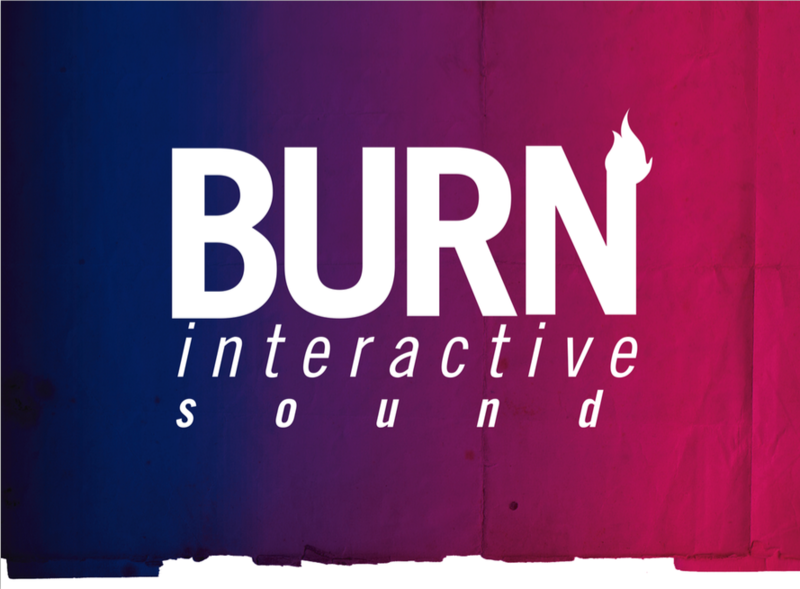 Game Design and Audio by Burn Interactive Sound. Music for the home and level 1: Filo Martínez-Aparicio. Music for level 3 and Credits Theme: Tariq Burney. Lucid’s Voice: Naila Burney. God Flame’s Voice: Filo Martínez-Aparicio. Sound Design: Naila Burney. Game Design: Tariq Burney. Art and Programming by Glitchy Pixel. Art: Diana Esperanza Pacheco. Programming: Italo Capasso.